One of my favourite things about visiting Italy (especially in summer) is the weather! A fact which makes pretty much all of the best hikes in Italy something you have to experience, not just in summer but all year around. 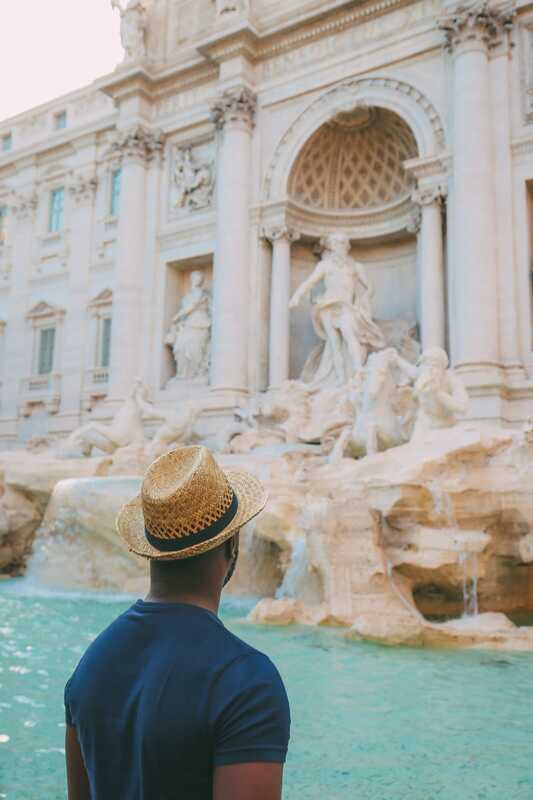 But let’s face it – by now, you probably already have far too many reasons why you want to visit Italy (not that you could really have “too many reasons”). I get it. I feel like I keep finding myself new reasons to want to return to Italy, sometimes, to places I’ve been to multiple time! Like, I really want to spend a month in Florence one summer. I’ll probably need a new wardrobe the time I’m done with my month there (all I did last time I was there was eat) but that’s a price I’m willing to pay. 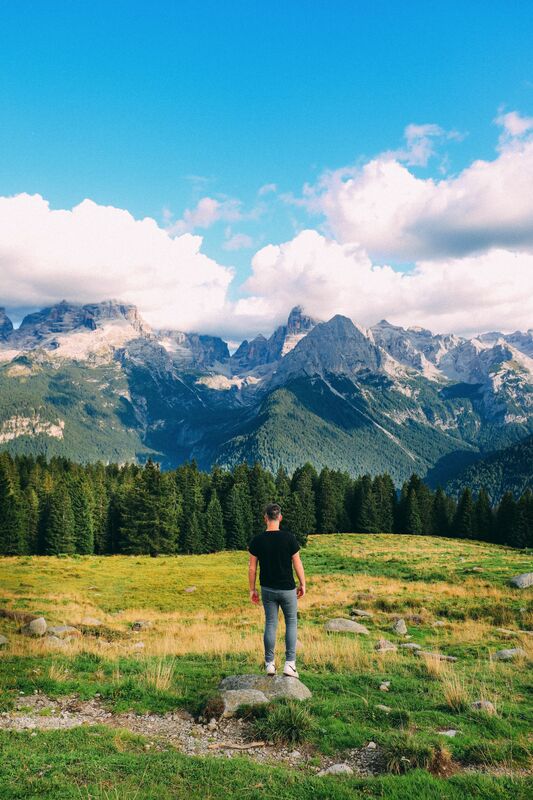 The thing with Italy though is that there’s so much more to it than just the cities and towns we all tend to – something we got to experience first-hand in the Dolomites. There’s this whole natural side of Italy that can sometimes be overlooked for the appeal of it’s absolutely beautiful, historic cities. 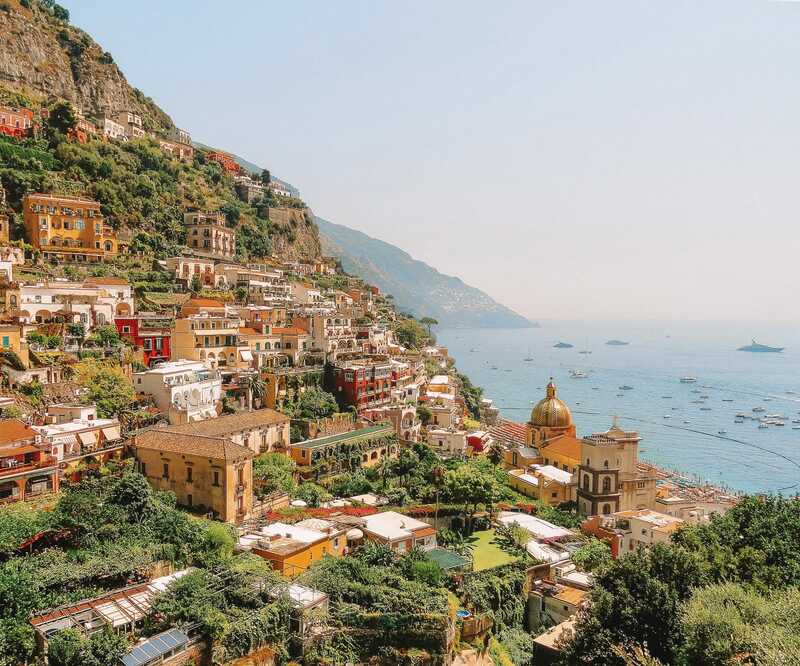 Italy’s got towering mountains and huge sandy beaches, yes it’s got amazing architecture but there are also active volcanoes, stunning coastlines and even an old pilgrimage way that traverses through multiple towns and cities. 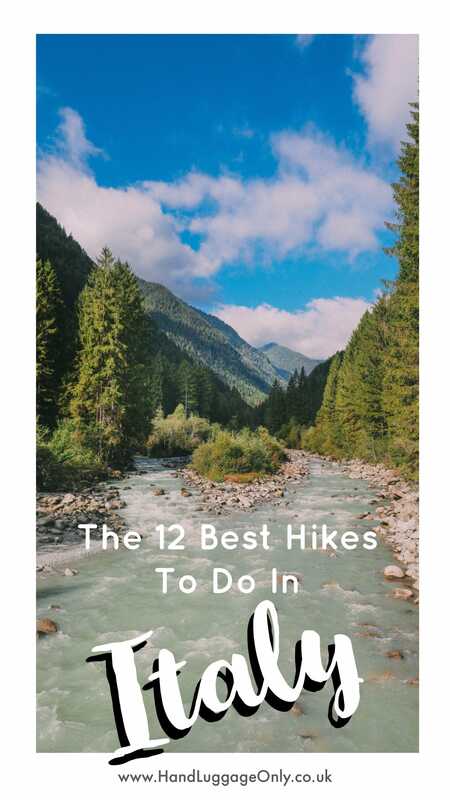 Long story short – Italy is a stunning country that is sometimes best explored on foot and with that in mind, here are the 12 best hikes in Italy you just have to experience when you visit! 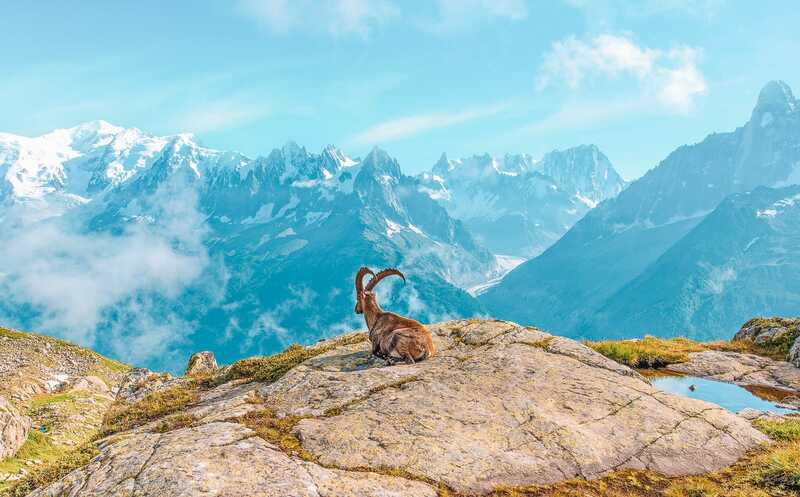 This is a strenuous long- distance hike that spans a 20.5-km trail that begins and ends in Valnontey (for the uninitiated – this is the near the part of Italy where it meets with France and Switzerland). 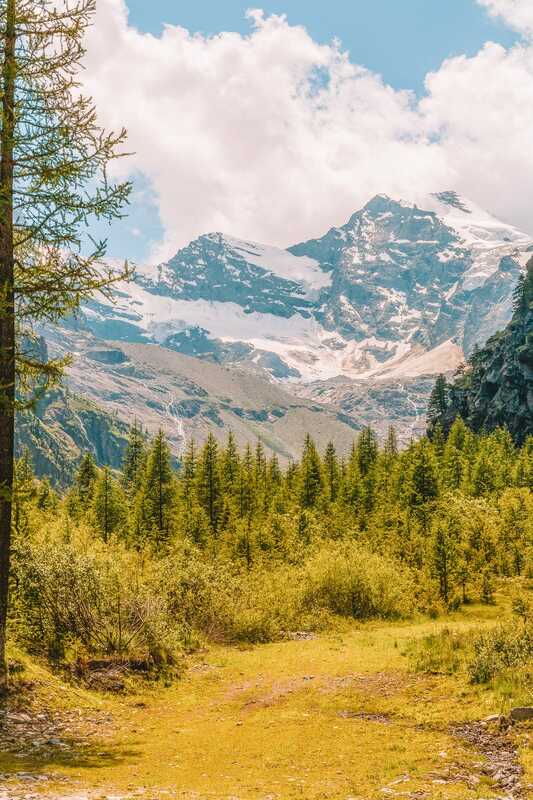 On this hike, you will walk past a number of pristine, beautiful lakes but the real treat is the climb to the very heart of Gran Paradiso, which stands 4061 meters tall! This is an ideal spot to get some well-earned rest while taking in the breathtaking view around (and yes, I know it’s a hardship but if you did bring your camera up with you, now’s the time to use it). If you are keen on wildlife, this hike won’t disappoint! There are a number of curious ibex dotted around this path that are typically not that concerned with the presence of humans. In English, Sentiero Azzurro translates to “the blue trail” and the reason for this name is obvious as soon as you set your sights on the clear blue waters of the Ligurian Sea which is visible for the entire walk. This hike is absolutely beautiful, leading you through all five of the quaint towns (“Cinque Terre” translates to “5 Lands”) located here. 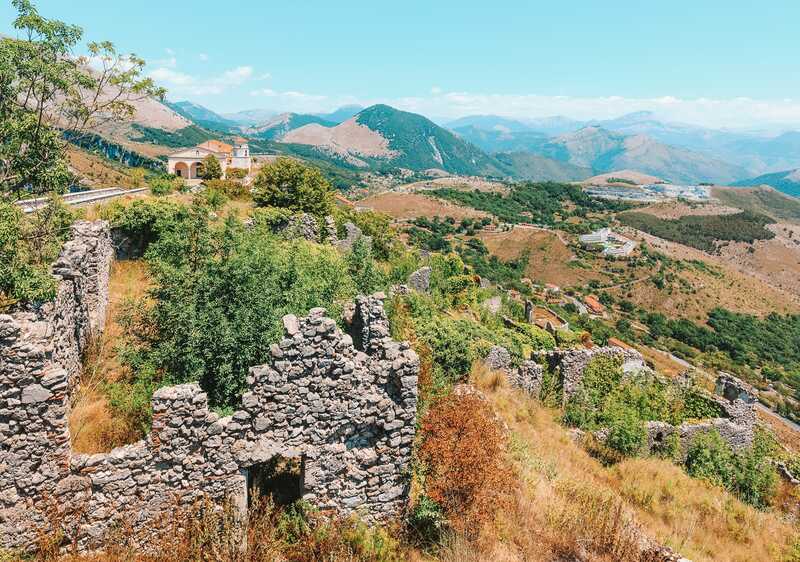 These villages are dramatically perched on cliffs overlooking the water, and (as you probably already know by now), their brilliantly multi-coloured, higgledy-piggledy vista is quite the sight to behold. Be sure to stop in these villages for a taste of some of the most delicious, and not to mention, the freshest local seafood around these parts. Nessun Dorma in Manarola is a place you must make time to stop at, preferably in the early evening. The brilliant food and wine selection here is almost overshadowed by the picture-perfect sunset views that can be seen right from your table – making it one of the most balanced and definitely one of the best hikes in Italy. 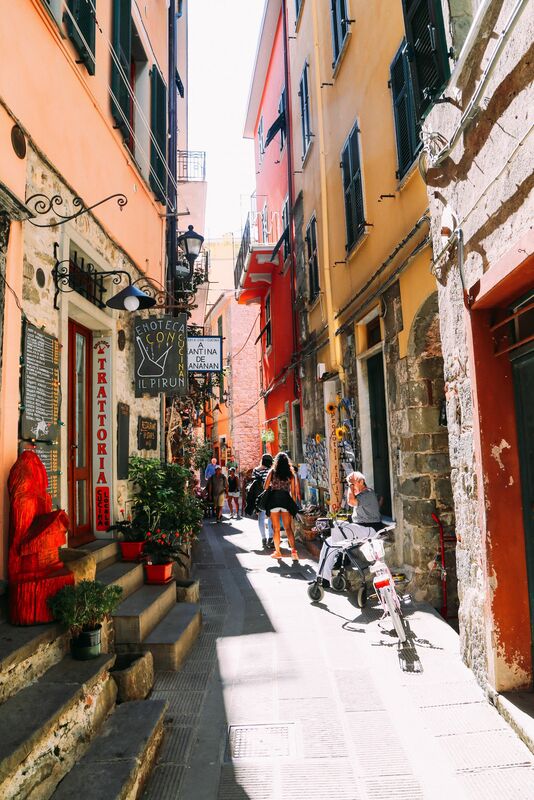 When you’re in Cinque Terre, check out these posts here to help you along your merry way. 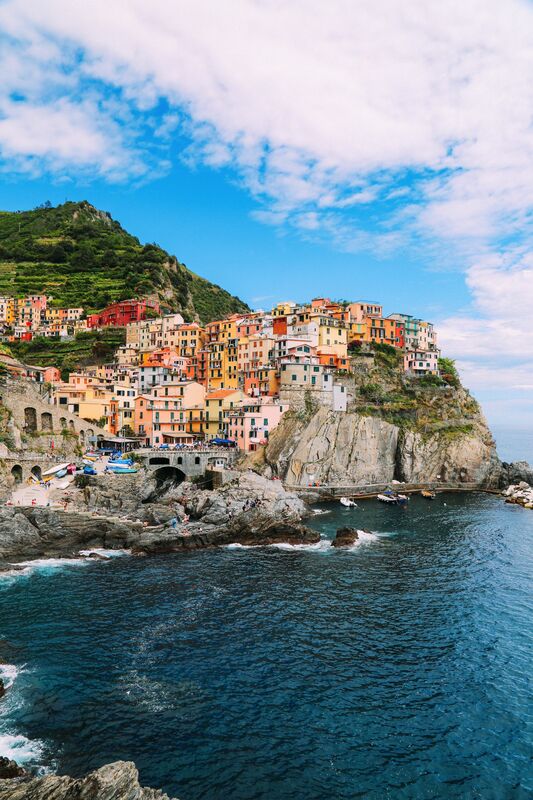 The Complete Guide To Visiting Cinque Terre in Italy! 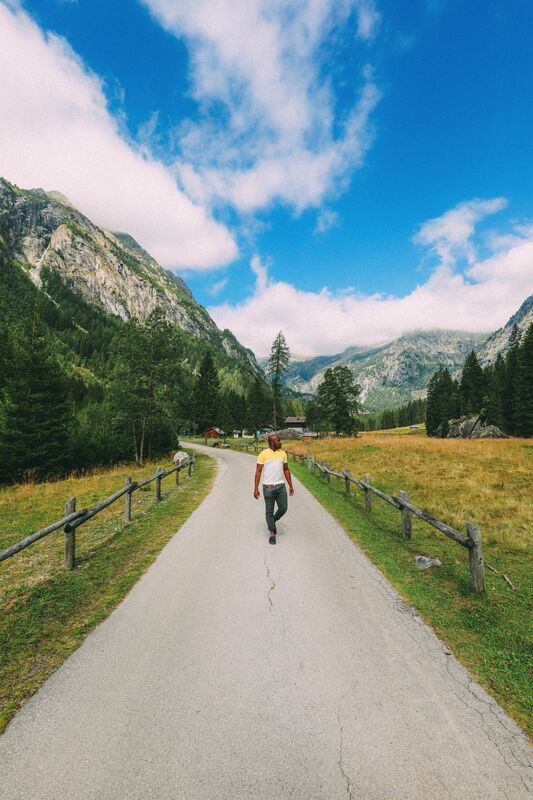 This is an ideal hike for anyone exploring the Dolomites that prefers a moderately easy hike over the more challenging routes, yet still wants to be treated to jaw-dropping views. 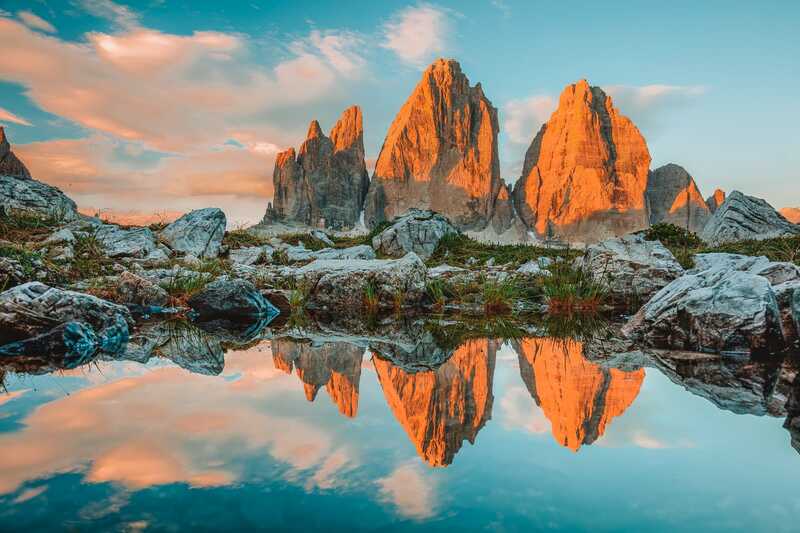 A perfect day hike, you will ascend to a viewpoint that showcases gorgeous views of the Tre Cime, a name referring to the triplet mountain peaks that are located here. See more about this beautiful part of Italy here. 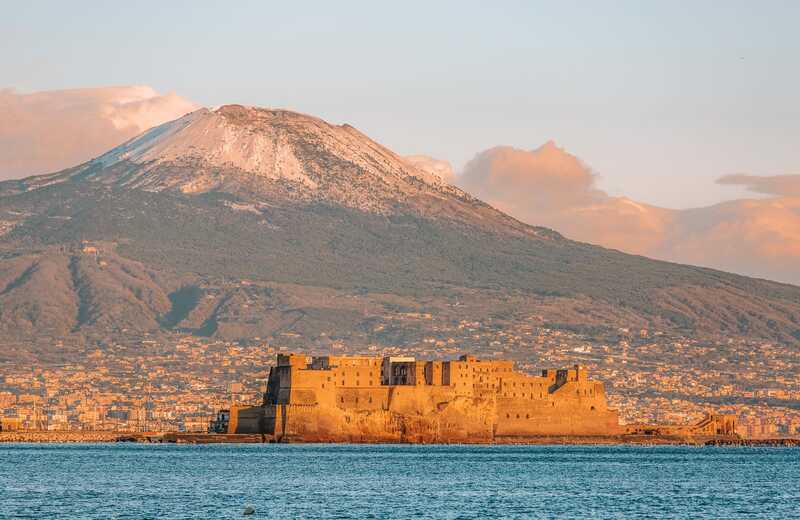 This is an opportunity to explore one of the most infamous volcanoes in Italy – one that once destroyed an entire city. Mount Vesuvius violently erupted in 79 AD, burying Pompeii (see here) in a cloud of volcanic ash and lava. This, by the way, is short, easy hike. Most people are easily able to make it to the top in about a half an hour. Understandably, the summit of the hike is the highlight, as you are able to experience a first-hand view of the volcano that once caused so much destruction. Of course, after you hike the volcano, it is kind of a given that you must pay a visit to the ruins of Pompeii. (*Heads up – the queues here can be really long at certain times of the day). 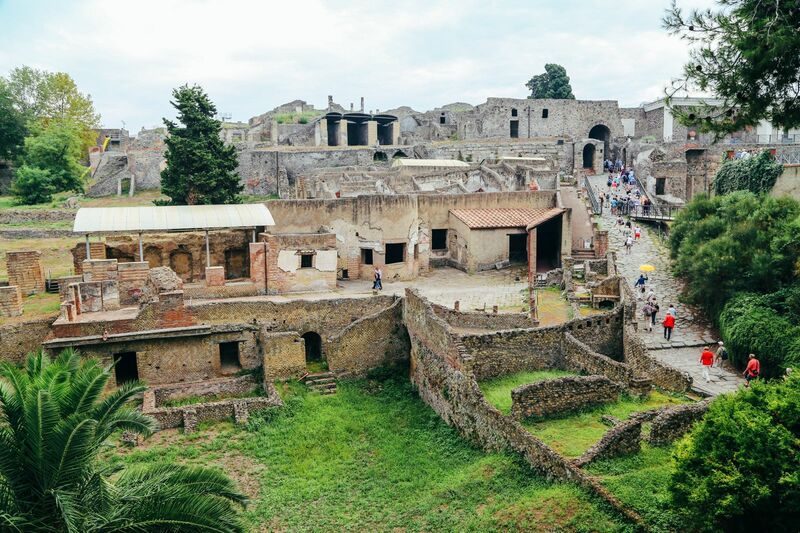 In Pompeii, you will see a moment of tragedy frozen in time, ancient Roman buildings, and even casts of some of the petrified victims of the tragedy. 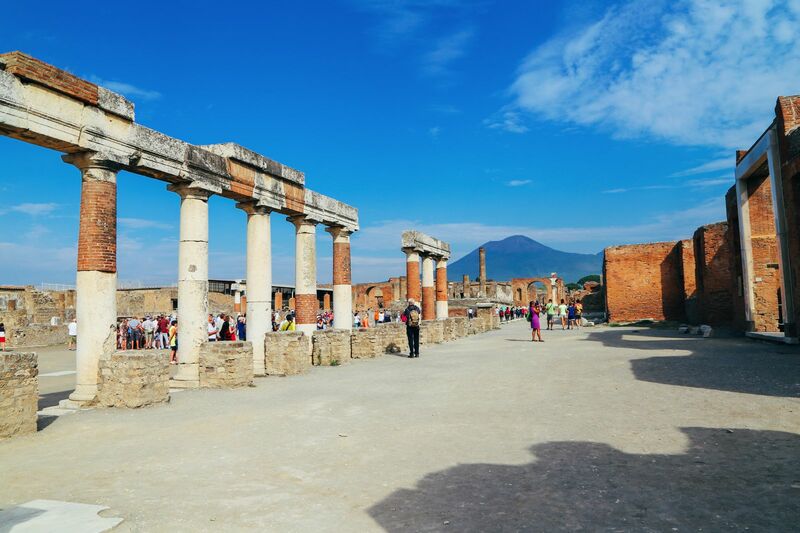 See more from our visit to Pompeii here. The name of this trail translates to “Path of the Gods” in Englishand is easily one of the most beautiful and definitely of the best hikes in Italy! A moderately easy walk spanning approximately 8-km of the Amalfi Coast, you will find many amazing views of the Mediterranean Sea and the distant island of Capri. The hike ends in Praiano, a historical fishing village (remember it from here?). Reward yourself by having a meal at Da Armandino. 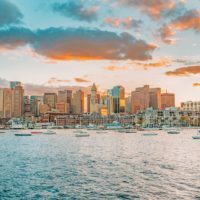 This popular restaurant does not even have a menu – instead you rock up and get an offering of daily specials with the freshest fish and shellfish available. At 2,192 meters tall, the Corno Grande, or Big Horn, is the highest mountain peak in the Appenine mountain range. There are two different paths to the summit, depending on how much of a challenge you are looking for. The normal route is ideal for those who are looking for a moderately difficult trail, while the direct route is far more challenging. At the peak of Corno Grande, you will not only have panoramic view of the Adriatic Sea, you will also be able to catch a glimpse of the southernmost glacier in all of Europe (ergo why this is one the best hikes in Italy). The trail is speckled with chamois, cattle, seabirds, eagles and other local wildlife, so be sure to keep an eye out for them along the way! This is perhaps the most beautiful hike in the entire Dolomite region and understandably one of the best hikes in Italy. You begin at the largest natural lake in the Dolomites, Braies Lake (it is absolutely stunning here – seriously worth visiting in and of itself). 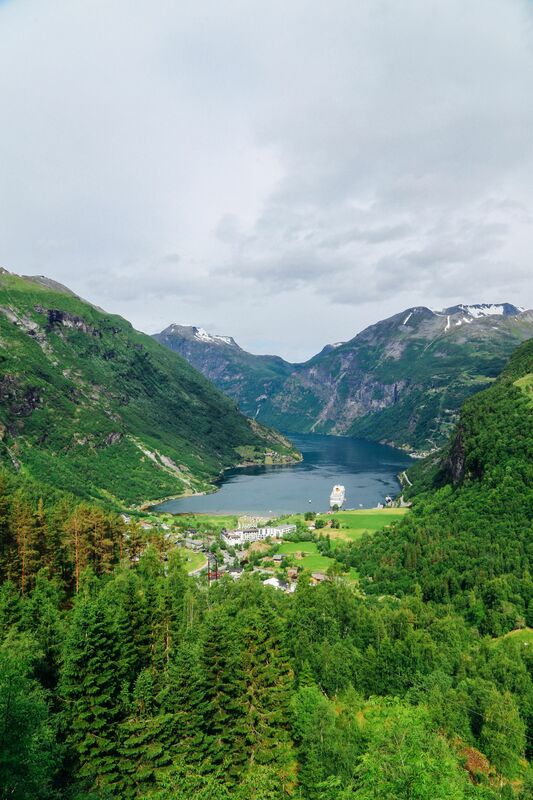 From here, a 150-km trail leads you through the dramatically beautiful landscapes, including some rather impressive glacial cliffs, coupled with rugged mountainous peaks. The hike ends in the village of Belluno, which is home to the Palazzo dei Rettori, a stunning showcase of 15th century architecture. 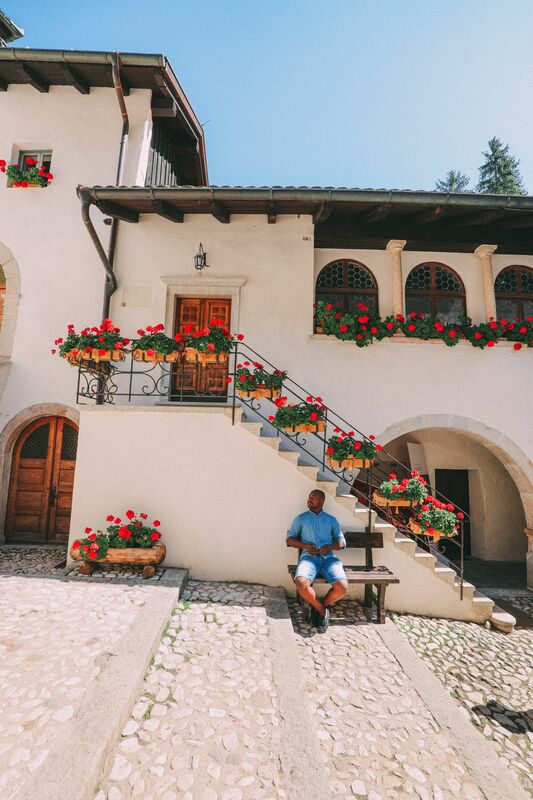 After your hike, you can explore the Palazzo along with other sights in the village before finishing the day with dinner at Al Borgo, which is one of the best restaurants, not just in town but across Northern Italy. Hiking around this area can be a tad harder (you are hiking up mountains after all) but it’s easily one of the best hikes in Italy that we’ve done thus far! 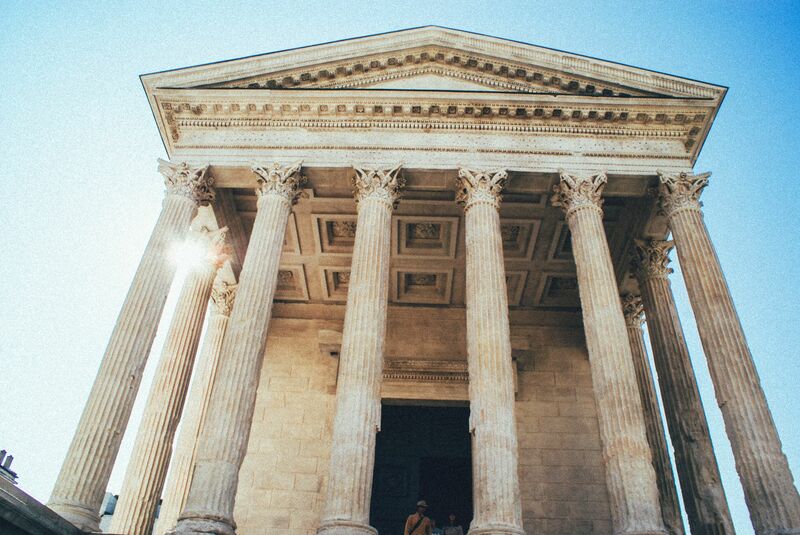 Check out the post below for more of what it’s like to visit this part of Italy. 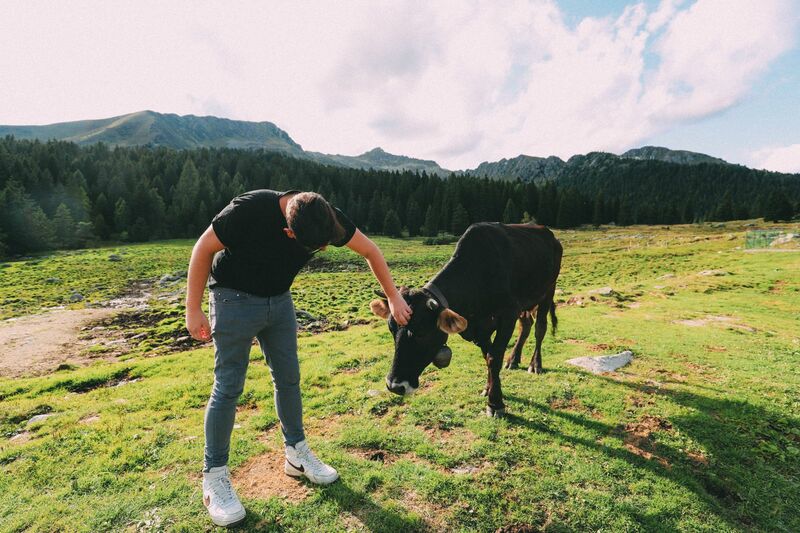 Here’s The Part Of Italy You Never Really See But Absolutely Have To Visit! This one is one of the best hikes in Italy as it is quite a unique experience unlike many of the others on here. 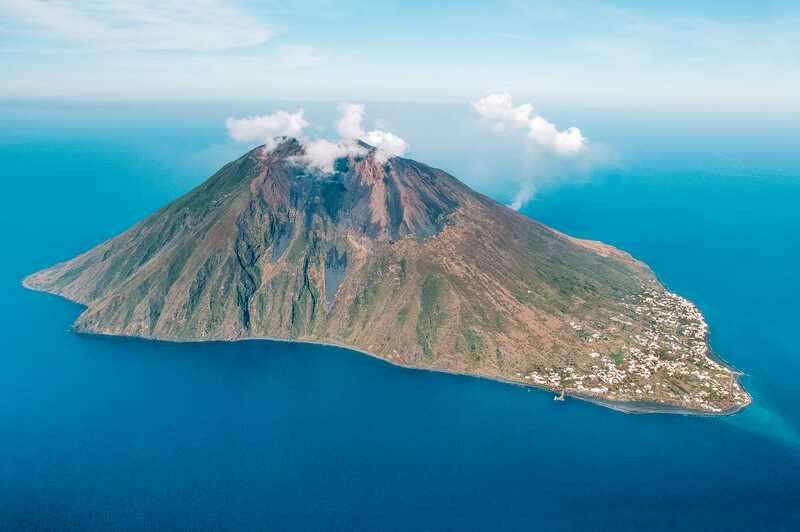 On this hike you have the opportunity to ascend to the summit of Stromboli, the only permanently active volcano in Europe! 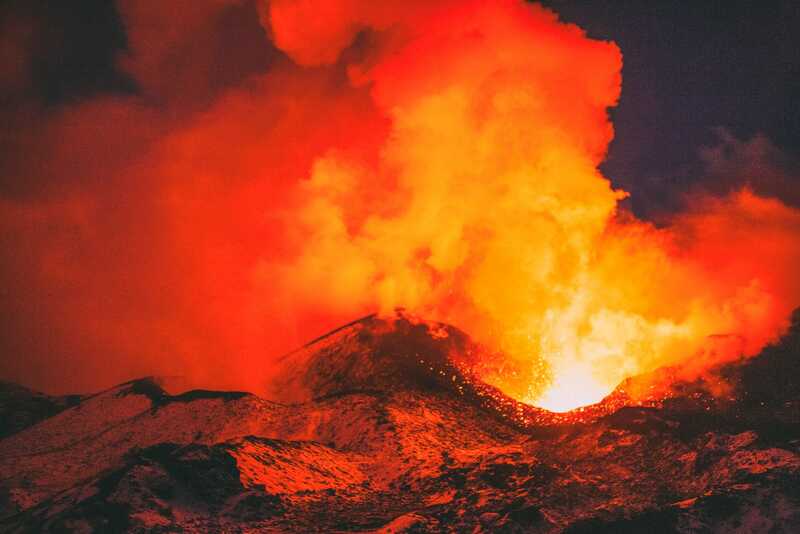 Located on the Aeolian Islands of Sicily, Stromboli is a moderately challenging walk that takes around five to six hours to complete, round trip. The true gem of this hike is when you reach the summit, as you are literally able to look into the crater of an active volcano! It is important to note that shifting thermal conditions can affect the area, so be sure to check for any potential trail closures before you leave on your hike! 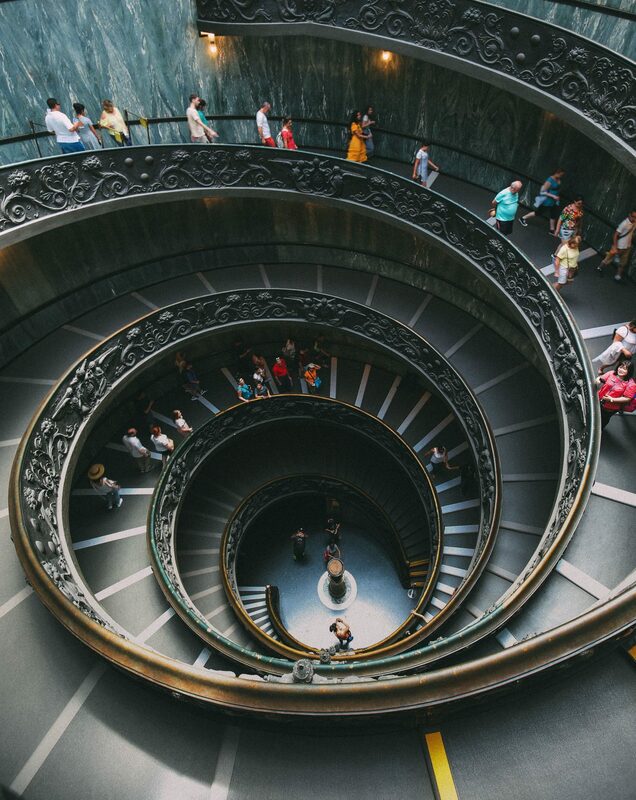 There are so many different sites to see in the city of Rome that it is well worth taking a guided walking tour to ensure you are able to take it all in. (And trust me, after a few days of trekking round the city – you’ll certainly feel like you’ve been on a major hike). 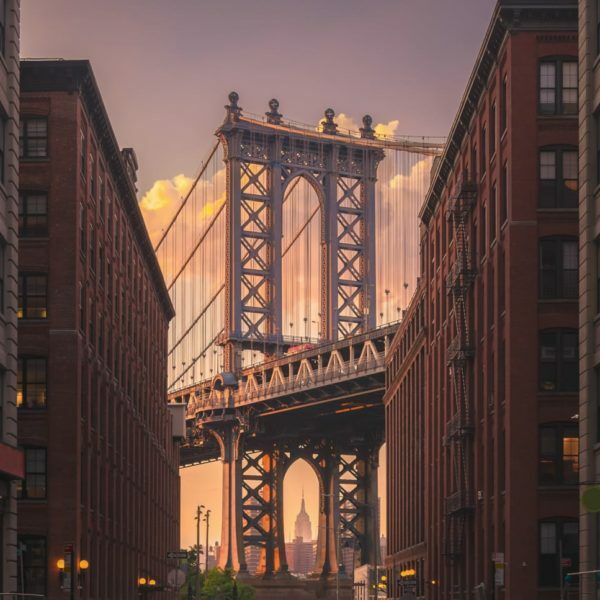 There are, of course, a wide variety of walking tours that range from easy to moderate, all with a different emphasis on the city. 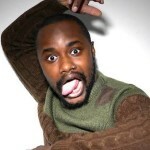 You can participate in a historical walking tour, which will lead you past the Colosseum and through the catacombs, or book a tour with a more personalized edge – for example a local’s food tour (it’s Italy after all – you’re gonna have to end up fitting some sort of food tour in, even without you knowing… 😄😆). This 10.5-km hike is one of the most spectacular trails for getting an intimate view of Lake Como. 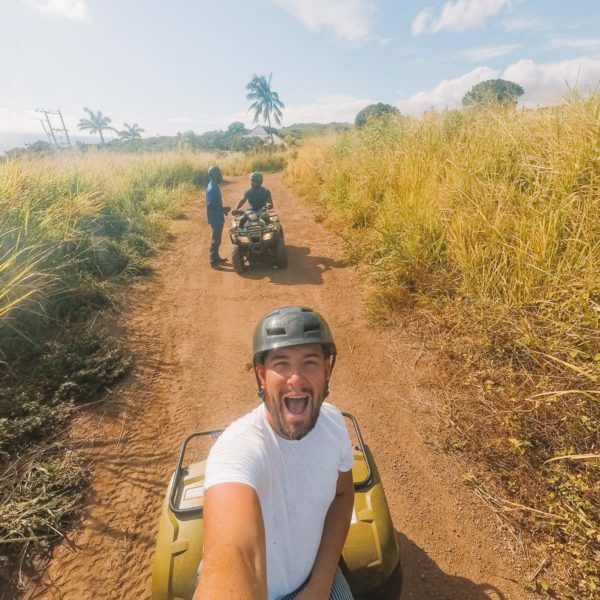 You are able to pick this trail up from multiple points along the shoreline, so you can choose to walk the entire length or a shorter excursion. 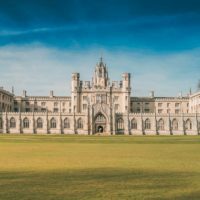 Along the way, you’ll have the opportunity to check out some pretty famous villas located along the lake’s shore, including George Clooney, Donatella Versace, etc. The real gem of this hike is Lake Como itself, abound with many opportunities for a relaxed, fun holiday in Italy. 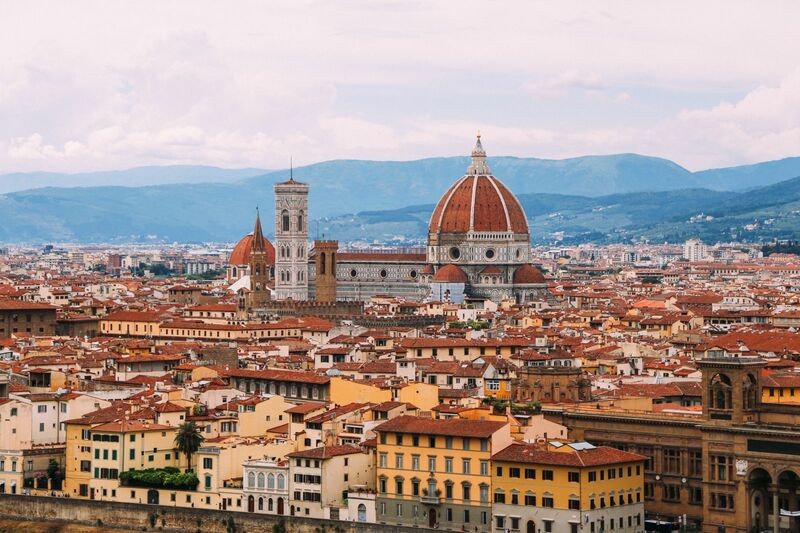 Florence has some absolutely stunning opportunities for anyone looking for a moderately easy hike with scenic views. The Renaissance Ring is a wonderful area for anyone who is looking to get a glimpse into Tuscany’s history and scenic landscape without embarking on a strenuous trail. Here, you will walk past medieval towns and monasteries as well as olive and lemon orchards. There are many local inns and taverns to pay a visit to along the way, but perhaps a particularly unique opportunity is the chance to picnic on the grass outside of an Etruscan tomb! 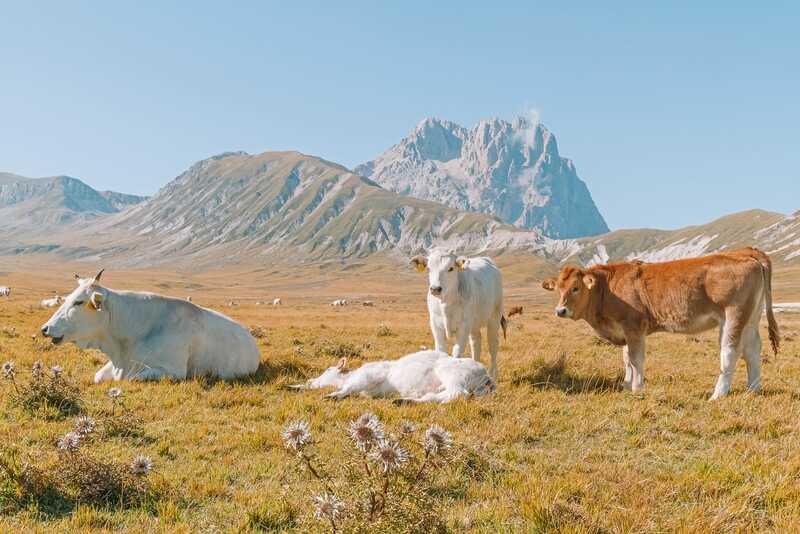 Here, you will have the opportunity to view wildlife, such as ibex, cattle, sheep, seabirds and all sorts of critters, yet the main draw of this hike is, of course, the spectacular views along the way. You’ll come across churches, ruins and small farhouses set against a magnificent background. The summit is a wonderful place to stop for a picnic and to rest your feet before beginning the descent. It is definitely worth noting that there is very little shade available on this hike, so it is important to try to leave early and at the very least, wear an abundant amount of sunscreen on your hike here.